Human Nature is a series of interconnected stories about nature, people, government, and the science of our relationship to wilderness. Lucas Foglia (b. 1983, US) deftly navigates the strange conceptual territory, where wild nature is both a quenching oasis and a shimmering mirage. His photographs show people gazing at nature, touching it, submerging themselves in it, studying it, nursing it, killing it, profiting off it, and, often just barely, surviving upon it. Lucas Foglia grew up on a small family farm surrounded by forest, just outside New York City. The starting point for his latest project Human Nature is Hurricane Sandy. In 2012, this hurricane flooded his family’s fields and blew down the oldest trees in the woods. On the news, scientists linked the storm to climate change caused by human activity. Foglia realised that if humans are changing the weather, then there is no place on earth unaltered by people. Human Nature begins in cities and moves through forests, farms, deserts, ice fields, and oceans, towards wilderness. At a time when the average American spends 93% of their life indoors, Foglia photographed government programmes that connect people to nature, neuroscientists measuring how spending time in the wild benefits us; and climate scientists measuring how human activity is changing the air. Lucas Foglia is a storyteller in the tradition of the great American photographers who show social commitment without losing sight of the aesthetics. His exhibition in Foam will show 35 large format works from Human Nature, plus an installation of books and images made in collaboration with the scientists he photographed. A monograph, published by Nazraeli Press (2017), will accompany the exhibition. 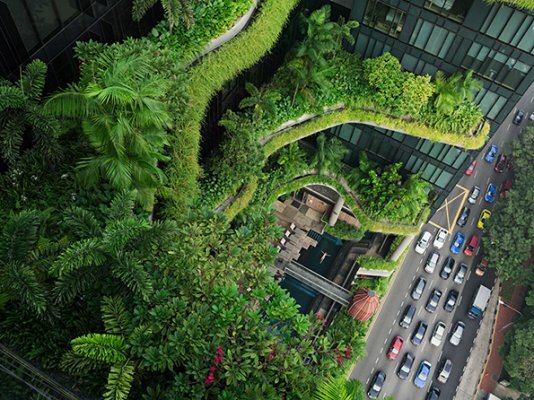 Lucas Foglia - Human Nature can be seen from 2 February until 11 April 2018 at Foam. Open daily 10am - 6pm, Thurs/Fri 10am - 9pm. For information, interviews and visual material, and/or for general enquiries about Foam, including Print Sales (Foam Editions), Bookshop and Collection, please contact the Press Office of Foam at +31 (0)20 5516500 / pressoffice@foam.org.